This year’s (25th) Gingerbread Village at the Sheraton Hotel in Downtown Seattle, is a celebration of the city itself and a must-see for local holiday deco enthusiasts. This year marks the silver anniversary of the famed annual presentation, with “25 Years of Cheer: A Celebration of Seattle,” a creative, sugary take on visions of Seattle’s future, and past. 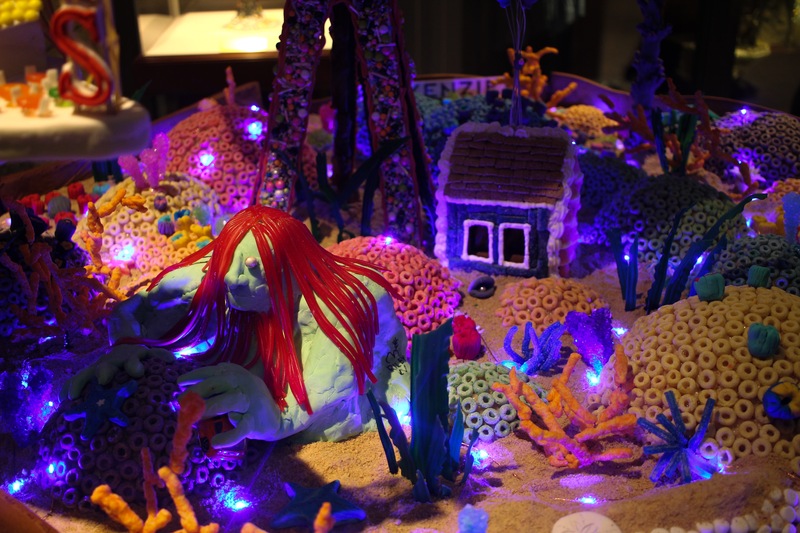 There are multiple large displays, with structures, landscapes, things made mostly out of reinforced gingerbread, frosting, candy bits, gummies, jelly beans, frost, and other sugary silliness combined with LED lights and some animatronics. Each display developed from the work of an architecture firm and lead “chef.” Last year’s Gingerbread Village theme focused on Harry Potter, and Star Wars the year before. Below are some pics of each display. Enjoy! For those who wish to visit and view, The Gingerbread Village is now free to the public until January 1, 2018. It’s all located by the Sheraton (still hosting) across the street from at the City Centre building. You are also encouraged to also give a monetary amount to the JDRF Northwest Chapter. For more site and event information including bios on the designers and builders (and to donate directly), visit www.gingerbreadvillage.org. Posted on December 9, 2017 by Orion T.	This entry was posted in Art, Photography, Seasonal and tagged Christmas, displays, gingerbread houses, holiday decorations, seasonal, Seattle, travel. Bookmark the permalink.